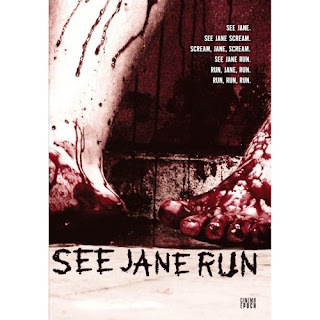 Ryan Webb's "See Jane Run" (2007) is a gruesome, brilliant little horror movie that harkens back to the good old days of gore and exploitation movies from the 1960's and 1970's such as "Bloodsucking Freaks", "The Texas Chainsaw Massacre", and "The Wizard of Gore". Just like these movies, it leaves you in a state of shock, wondering "What will they think of next? How can they top that last scene?" And it does not disappoint....it holds you from beginning to end. And after watching it....well, you may feel like you need to take a shower...but that's all part of the experience. Unlike it's predecessors from a bygone era, however, "See Jane Run", is a very slickly produced movie. It does feature some bizarre camera angles and some old country music in the beginning, along with some familiar plot devices but that's about as retro as it gets. Something isn't right here, but what? Oh, yeah. It's their host. You see, he really is a bloodthirsty cannibal that loves him some human flesh. "Why leave the flesh to rot in the earth with the rats and worms when it can live on inside of you?" he says. And he has already killed and eaten his family. That's why he lives in such a huge house alone. And he needs more human flesh! He is very moralistic for a cannibal. Very disdainful about cheating on your loved ones, as our teens do tend to sleep around a bit. And smoking. You can forget it. It taints the flavor of the meat. And he is all about some torture: human dart-boards, a hot iron strapped to the face, etc. etc. The torture scenes are intense and gut-wrenching. Will anyone survive and will there be anything left of them? You must watch this movie to find out.....it is time well spent.